Thanks for the amazing review! Could someone post a picture of the backpack the quest 135 fits into ..? i'm considering buying this model for a backpacking trip in Greece and would be very helpful. Even if you got a different pack to put it into, it's still a bit bulky for backpacking. A smaller Puffin might work, but even then, it'd be better for trips involving more paddling than packing. It's taken my surfing skills to a new level for me. It takes off on waves more easily than either my F1 or my Narak - I actually caught one wave while I was sitting still, which was a first for me, and... finally a skin on frame boat of mine that will surf diagonally down a wave face, which is just as well as although it doesn't purl (nose dive) easily, the bow is only slightly peaked and one of the bigger waves was so steep I came close to getting the bow under while still initially perpendicular to the wave. I was thinking about buying a P&H Delphin until today as I was so sick of my mate being able to surf diagonally in his while I couldn't in my F1. The Quest also feels quite drama free (less nervous) on a wave compared to my F1, perhaps because it flexes a bit more and the sponsons give a smooth ride. The F1 is still better at resisting purling due to the big volume bow but broaches much earlier if not perpendicular to the wave. The 135 was also very stable and forgiving side on in a steep breaking wave I didn't get off in time. Even though the surf was at shoulder height and I was thrown off balance so braced on the wrong side (away from the wave), I managed to stay upright by leaning into the foam. 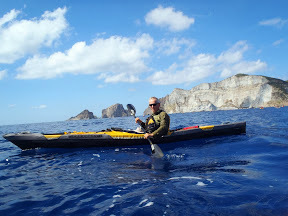 On the way back to the marina, I caught some swells that I would have missed in my other kayaks, and was impressed by its secondary stability in waves rebounding off cliffs (clapotis). Although the bow gets thrown about more than my F1 by waves breaking side on, I had to brace lees than I did last weekend in my F1 in similar conditions, which surprised me as the F1 is very good indeed in rough water. Thank you so very much for all the detailed information. Forgive me if you've covered this, but I'm curious about something: How well does the deck seal work? From what you've described, I'm getting the impression that it seems to work well, but don't remember seeing this specifically described. Good question. I think I've answered it before somewhere but to cut a long story short some water does get in in surf or breaking waves, but generally not enough to worry me. At first I thought it was more noticeable than it should be but then I fitted a better spray skirt (Reed thin neoprene from my Nautiraid Narak) and it improved considerably. I carry a microfibre cloth with me and wring it out every so often if I feel like it, but not because I have to, even when side surfing last weekend, but then I'm quite light at 145 lbs so freeboard is ample. The only time I think I need to use the pump is after multiple rolls when I'm practising, and even then I just use the cloth sometimes. I agree that it's not ideal and I'd prefer a heavier deck with waterproof zippers, but the dynamic qualities of this kayak are sooooooo good, at least for my wants, that it's very easy to live with it. A detachable deck and free floating sponsons also means it dries aout really quickly, important if you have to carry it any distance, especially uphill! Thanks Simon. I'm still uncertain which kayak I am taking to England next June. The weight of that Pakboat is attractive. Took the Quest out surfing again on the weekend. Discovered a limitation that perhaps applies to other folders in surf. Once I'd got a diagonal line set up on the smaller 3 foot or so waves I was surfing, it was very difficult to change direction again (cut backs). My mates watching me said they could see the hull twisting as I edged the kayak, which meant that my input wasnt translating to the hull in the water. Has anyone notice this with folders in surf? Thinking of the TRAK in particiular. It's odd as the Quest feels quite rigid normally, but of course it could just be (my) poor technique. Got dumped a couple of times too in breaking waves so feeling less cocky now about side surfing. When those sleeves for the gunwale tubes get sand in them it's a real pain to get it out when you're cleaning the kayak afterwards. Though this is based on my limited experience and understanding of folders, I would venture to say that the vast majority of folders probably don't do well in surf because most are at least somewhat flexible. I had a Folbot Cooper that didn't seem to do very well in anything more difficult than moderately turbulent conditions. While the flexibility was actually beneficial in light-moderate turbulence, in rougher conditions and stronger current it was somewhat more difficult to control and maneuver; because of the high flexibility it tended to go where the water was going rather than where I wanted to. I would never, ever have taken my Cooper into surf - it would've been thrown around like a big piece of cardboard. The only folder I know of that seems capable of handling heavy surf is the Trak; supposedly it can handle just about anything. Thank you for your continued updates.